In just a few weeks, the people of Colorado are collecting for an evening celebration of community and healthy hemp through the sharing of a delicious vegan feast, hosted by Green House Healthy, and you’re invited! This one of a kind dinner party, at the Courtyard by Marriott in Westminster, CO, will give guests the chance to sample several local Colorado hemp foods, prepared by private vegan chef, Sonja Miltner, of Fresh Perspective! After the incredible meal, each attendee will go home with a goody bag filled healthy products from sponsors, and there is an amazing guest speaker lined up, but you’ll have to read more to find out who! Vegan Hempsgiving also gives us all a chance to celebrate Earth, by promoting the positive environmental impact of plant-based diets, and the production of hemp. Did you know eating just one vegan meal saves an average of 3000 gallons of water, per person? Or that hemp as a protein source is arguably the best plant based protein, and it takes more than 11 times as much fossil fuel to make 1 calorie of animal protein as opposed to plant protein? Green House Healthy is dedicated to promoting methods and practices that contribute to personal well-being and the health of our planet. It only seems fitting to give our thanks to the planet by showcasing the delicious versatility of plant-based diets and local hemp foods! 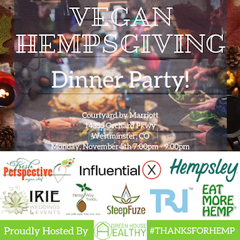 We are so grateful to have the support from several local hemp foods companies whose amazing products will be used to create this unique vegan feast! The menu will include the use of hemp burger crumbles by Hemp Way Foods, hemp sausage and chorizo by TRUthfull Bites, hemp seeds, protein, and flour from Eat More Hemp, hemp CBD coffee by SteepFuze, and a special hemp CBD beverage toast by Intrepid Botanicals and Irie Weddings and Events. 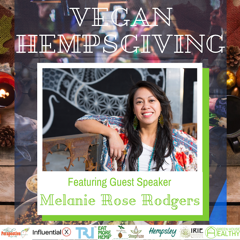 It is Green House Healthy’s honor to be featuring local hemp and cannabis advocate, Melanie Rose Rodgers, as our guest speaker! 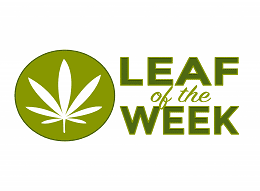 Last December, Melanie was recognized among her peers and nominated for Advocate of the Year in Colorado’s 2017 Cannabis Business Awards along with notable names such as Joe Rogan and Montel Williams. After 3 years of various marketing and business development roles with a handful of cannabis nonprofits and a cannabis branding agency, she started marketing consulting and organizing events and fundraisers through a company of her own, Influential X. Founded in 2017, Influential X combines Melanie’s natural inclination to drive business growth using her creativity, experience and marketing knowledge to produce influential, educational experiences. With Influential X, she’s found that creating events focused on education, advocacy, and social responsibility culminates in a positively engaged community in action. In addition to hearing from Melanie, and taking home the satisfaction of supporting the local and global community by sharing this delicious vegan meal, you’ll also go home with bags filled with goodies from sponsors, like gift cards to the PHYTO Therapeutic Center! Early Bird tickets are only $25, and they’re only sale until October 15th, but we’re offering our readers a special discount as a thank you for your support! Select the regular ticket for $40, and enter promo code READER for $15 off, ensuring you get the Early Bird price even after October 15th! See you there!